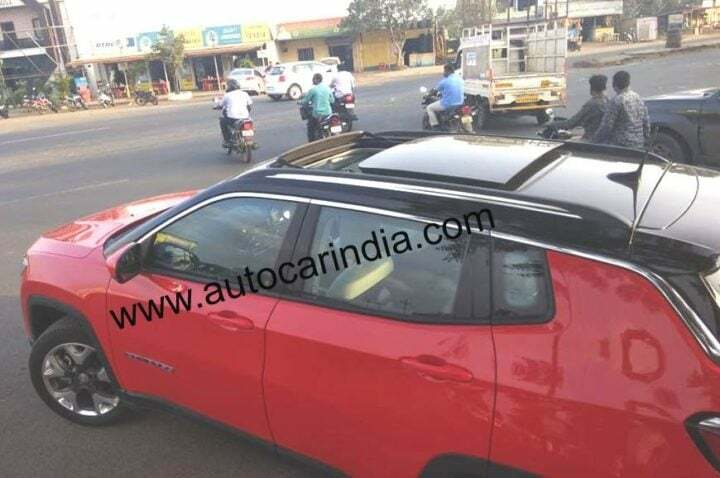 Latest media reports suggest that Jeep Compass will soon get a top of the range Limited Plus variant, which will come with a Panoramic Sunroof. The variant is expected to launch next month. Jeep Compass is one of the most popular SUVs in its segment. Despite having the huge brand name of Jeep, the Compass fails to live up to our hopes. The SUV is a soft-roader with a lot of off-roading features. Currently, it comes in total 10 variants with petrol and diesel engine options. It starts at Rs 15.35 Lakhs and goes up to Rs 21.94 Lakhs (ex-showroom Delhi). Now, the latest scoop from Autocar India reveals that there is going to be a new top-range variant in its lineup. The Limited Plus variant might launch next month. It gets some cosmetic upgrades along with new features. It has been spotted testing on roads and the most imminent thing seen is the new Panoramic sunroof. New Features onboard the Jeep Compass Limited Plus variant include a panoramic sunroof, a larger 8.4-inch touchscreen infotainment system, new set of alloy wheels, power adjustable driver and front passenger seats. Rest all the features will come from the Limited variant. For safety, it will come with dual-front airbags, side and curtain airbags and rain-sensing wipers as standard fitment on this variant. It will continue to come with safety features such as 6 airbags, cornering fog lamps, all season tires, electronic parking brake, Electronic stability control (ESC), and Reverse parking sensors with a reverse camera. The Limited variant of Jeep Compass comes with features such as leather-wrapped steering wheel, Uconnect infotainment system with Apple CarPlay and Android Auto, automatic temperature control, steering mounted audio controls and more features. On the exteriors, it comes with Halogen headlamps, LED DRLs, Electric ORVMs with turn indicators and more. For off-roading, it comes with features such as all-season tires, Frequency slect damping suspension, Dynamic Steering Torque, Jeep Active Drive and Select Terrain. Also, it features a 4X4 driving system. Despite having these features, it still fails to live up to its elders. Currently, the Compass comes with two engine options. It comes with a 1.4 Litre Multiair petrol and a 2.0 Litre Multijet diesel engine. The petrol engine churns out 163 BHP of power and 250 Nm of peak torque. The diesel engine outputs 173 BHP of power and 350 Nm of max. torque. The diesel engine comes mated to a 6-speed Manual transmission. The petrol engine comes with an option of 6-speed MT or 7-speed DDCT. Lastly, now, the Limited Edition retails at 21.94 Lakhs (ex-showroom Delhi). So, this variant might retail between 23-23.5 Lakhs, easily. Currently, the baby Jeep competes with the likes of Mahindra XUV 500, Hyundai Tucson, Honda CR-V and the upcoming Tata Harrier. The tentative launch date of the Jeep Compass Limited Plus is around Dussehra, next month.